The Maze Runner is a 2014 American dystopian science fiction action thriller film directed by Wes Ball, in his directorial debut. The film is the first installment in The Maze Runner film series and stars Dylan O'Brien, Kaya Scodelario, Aml Ameen, Thomas Brodie-Sangster, Ki Hong Lee, Will Poulter, and Patricia Clarkson. 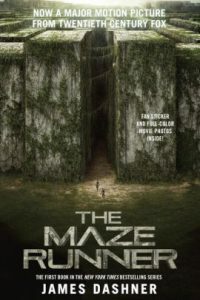 The story follows sixteen-year-old Thomas, portrayed by O'Brien, who awakens in a rusty elevator with no memory of who he is, only to learn he's been delivered to the middle of an intricate maze, along with a large number of other boys, who have been trying to find their way out of the ever-changing labyrinth - all while establishing a functioning society in what they call the Glade. if you liked the dystopian thrill of The Maze Runner, along with the mystery of identity, check out these titles - both young adult and some adult. A teenage girl awakens to find herself trapped in a coffin. She has no idea who she is, where she is, or how she got there. Fighting her way free brings little relief - she discovers only a room lined with caskets and a handful of equally mystified survivors. Beyond their room lies a corridor filled with bones and dust, but no people and no answers. After his parents, two sisters, and he has spent six years in a vast underground compound built by his wealthy father to protect them from a nuclear holocaust, fifteen-year-old Eli, whose twin brother and grandmother were left behind, discovers that his father has perpetrated a monstrous hoax on them all. "Are you happy with your life?" Those are the last words Jason Dessen hears before the masked abductor knocks him unconscious. Before he awakens to find himself strapped to a gurney, surrounded by strangers in hazmat suits. Before a man, Jason's never met smiles down at him and says, "Welcome back, my friend." In this world he's woken up to, Jason's life is not the one he knows. Adult title. Canaan is a quiet city in an idyllic world, hemmed in by high walls, but every twelve years the town breaks out in a chaos of bloody violence, after which all the people undergo the Forgetting, in which they are left without any trace of memory of themselves, their families, or their lives - but somehow seventeen-year-old Nadia has never forgotten, and she is determined to find out what causes it and how to put a stop to the Forgetting forever. The final exam for Dr. Matson's Advanced Survival class was meant to be just that: only a test. But something has gone terribly wrong. . . and now Rod Walker and his fellow students are stranded somewhere unknown in the universe, beyond contact with Earth, at the other end of a tunnel in the sky. Stripped of all comforts, hoping for passage home that may never appear, the castaways must band together or perish. For Rod and his fellow survivors, this is one test where failure is not an option. Adult title. A girl, estimated to be sixteen, awakens with amnesia in the wreckage of a plane crash she should not have survived and taken into foster care, and the only clue to her identity is a mysterious boy who claims she was part of a top-secret science experiment. View more suggestions for The Maze Runner.